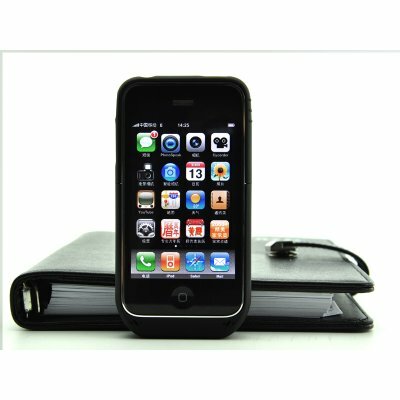 Successfully Added iPhone Battery Case - Slim Edition Battery Charger (For 3GS, 3G) to your Shopping Cart. The sexiest iPhone battery case yet! Unlike 99% of the other iPhone battery cases on the market, this one is so slim that you can easily put it in any jean or shirt pocket without noticing any difference at all. That’s because the total thickness with phone attached is only 0.78 inches which is only 0.3 inches more than the iPhone itself! The edges of the case are curved so it feels very natural in your hand and the protective material is hard but semi "grippy" which makes it good for grip- but not too “grippy” that it will get stuck in your jean pocket. Simply put, this battery case fits like a glove— after a few minutes you will completely forget it is even there! On the back of this case is three blue LED lights for checking the battery’s charge status, a powerful LED light for taking pictures in the dark or to use as a normal flash light, a ON/OFF switch, and a micro USB port for charging and syncing with your computer. Compared with name brand battery cases like the Mophie Juice Pack or the Incase Power Slider, this battery case is smaller, lasts longer, and best of all, cost less than one third of the price! This iPhone accessory is sure to sell quickly so get your single piece or bulk orders in now while this product is still in stock and ready for next day shipping. iPhone fits perfectly flush inside of the case!